Undrafted coming out of college, Johnson signed with the Seahawks and made the club, hitting on 10 of 14 field goal attempts during the strike-shortened 1982 season. He followed up with another solid year in ’83, kicking 18 field goals out of 25 attempts and 49 of his 50 extra point tries for a total of 103 points. Seahawks went 12-4 to finish second in the AFC West and qualified for the postseason as a Wild Card. Won AFC Wild Card playoff over Los Angeles Raiders (13-7). Lost AFC Divisional playoff to Miami Dolphins (31-10). 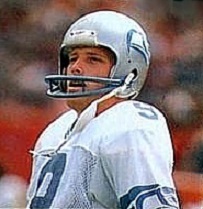 Outstanding at kicking off as well as consistent on field goals, Johnson went on to spend nine seasons with the Seahawks, through 1990. He left as the franchise leader in field goals (159) and scoring (810 points). Johnson went on to spend four years with Atlanta, gaining Pro Bowl recognition in 1993 when he was successful on 26 of 27 field goal attempts for a league-leading percentage of 96.3. Joining Pittsburgh in 1995 he led the NFL with a career-high 34 field goals and the AFC by scoring 141 points. He spent four years with the Steelers and finished his career with the Philadelphia Eagles in 1999 at the age of 39. Over the course of 18 seasons, Johnson kicked 366 field goals in 477 attempts (76.7 %) and 638 PATs for a total of 1736 points, which ranked fourth in NFL history at the time. He added another 20 field goals in 26 postseason attempts, including four in Pittsburgh’s AFC Divisional playoff win over Buffalo following the 1995 season. Johnson received consensus first-team All-NFL honors after one season, some first- and second-team recognition after one other year, and was twice selected to the Pro Bowl.